Didier Le Calvez has come to Bordeaux late in life, but that hasn’t stopped him from going all in. « I’m an old lion with young cubs, » he says with a wide smile. Le Calvez is tall and his stride is long. He moves with authority through his vineyards, stepping easily over a wide drainage ditch. At 62, he’s planted his flag just outside St.-Emilion, in the sometimes overlooked area of Puisseguin-St.-Emilion. With renowned consultant Stéphane Derenoncourt providing advice, Le Calvez looked at 40 properties before finally purchasing an abandoned estate in 2009. The project, renamed Château Clarisse in honor of his oldest daughter, is a homecoming of sorts for Le Calvez, who was born in Dordogne, France. Le Calvez is the modern gentleman farmer, putting in what time he can spare on weekends and vacations to oversee the renovation at the estate. His day job is managing the famed Le Bristol hotel in Paris, the capper to a long career that started on the F&B side of hotels in America in the 1980s. It was during those years that Le Calvez caught the wine bug during trips to Napa. After returning to work in France, Le Calvez was managing the Four Seasons in Paris. There, along with sommelier Eric Beaumard, Le Calvez visited estates in Burgundy and Bordeaux, further flaming his love for wine. It was through Beaumard that Le Calvez connected with Derenoncourt. The soil that both Derenoncourt prefers and Le Calvez has at Clarisse is a thin clay layer over limestone. Le Calvez demonstrates with a kick at the dirt, immediately uncovering a blanched white outcropping. That limestone gives acidity and freshness to the Merlot and Cabernet Franc grapes planted in it. Vines have been both replanted and field-grafted, in order to keep production at the estate at a viable level. 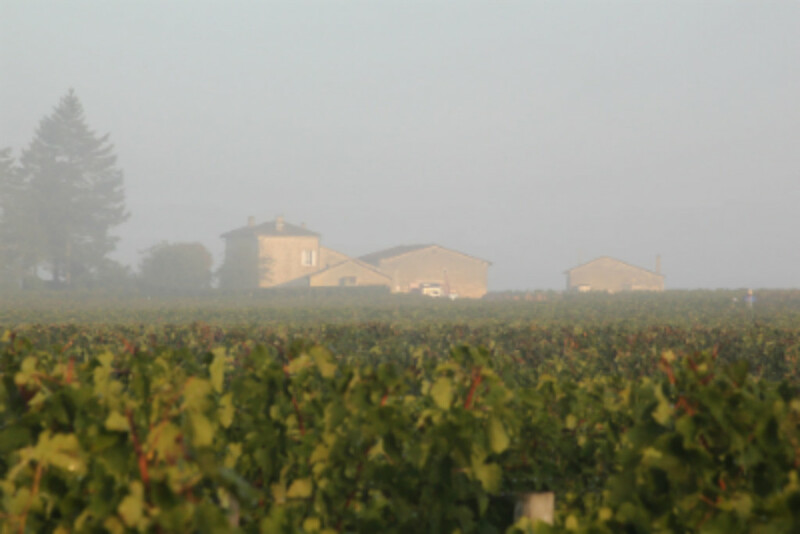 The main block behind the small château is also a windy spot, situated on a plateau at an elevation 30 meters higher than St.-Emilion, just a 5-minute drive away. As Le Calvez and Derenoncourt have brought the vineyards back to life, they’ve cleared out overgrown forest surrounding the parcels, promoting airflow to offset humidity, using the wind to fend off disease pressures. Along the way, Le Calvez has recognized that the project will take longer than he first anticipated. By the time the vineyard is in full production, Le Calvez will be able to produce about 5,000 cases annually.